Jacqueline B. Helfgott is professor and director of the Crime & Justice Research Center at Seattle University's Department of Criminal Justice. Helfgott, Jacqueline. 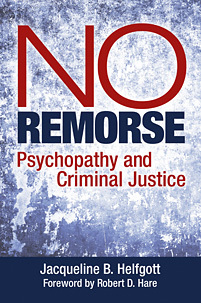 No Remorse: Psychopathy and Criminal Justice. Praeger, 2018. ABC-CLIO, publisher.abc-clio.com/9781440865756. An in-depth interdisciplinary perspective on psychopathy suitable for those interested in criminology and criminal justice, sociology, psychology, anthropology, and other social science as well as general knowledge.